My eyes rolled on the model of an enthralled owlet with the first morsel of sticky rice and mango slice served on AirAsia flight. Oh my good lord, where have I reached? The following days I danced on the flavors of Thai food, to say the least. My undergraduate study was based on food production for hospitality industry, with an obvious career graph of a chef. I say this to give you all a rough idea for my enchanted state. 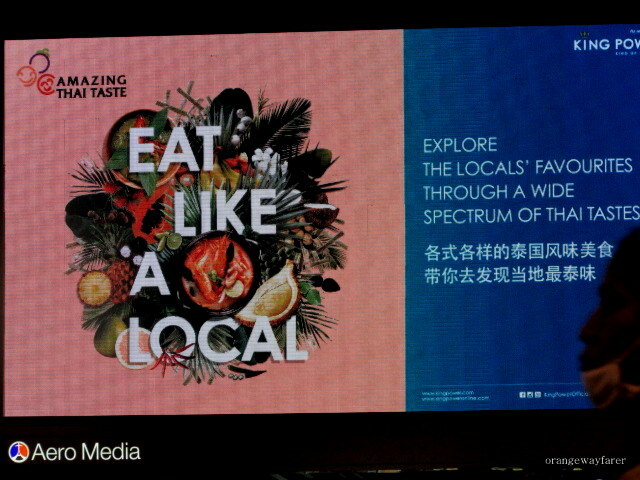 Further visits to the country was more motivated for the simple wish to gorge on a basket of grilled prawn by river Chao Phraya and less on basking on picturesque beaches. Here goes my endeavor to present the best of food clicks I could manage with phone camera, point and shoot camera or DSLR. Meanwhile I am preparing a composite blog detailing intricate food habit of the waterborne civilization. As I heard a Thai government official stating once, Thai people do not like to eat the same kind of food multiple time for consecutive days. Variety allures their pallet, resulting in relatively smaller portion size as well. The message here is loud and clear. When in the land of free, savor delicacies in free style! If one thing took my mind away, it will be the lobsters! What presentation of the jewels from the sea! 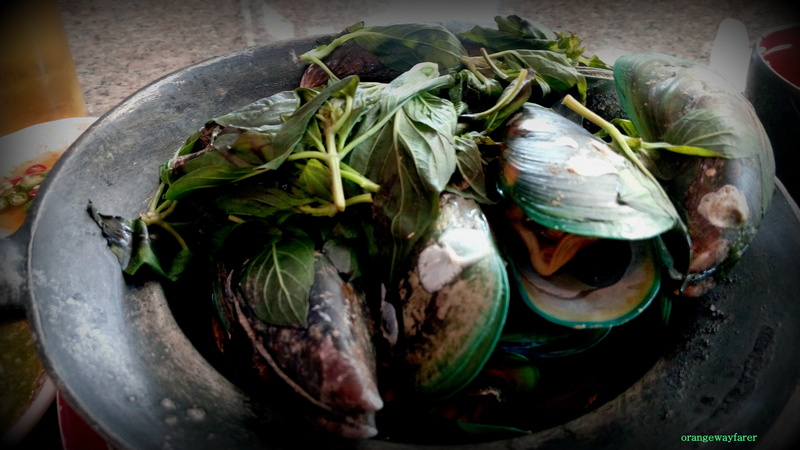 Here shown from the lane of Phuket, ready to be chosen by a guest and cooked to his taste! 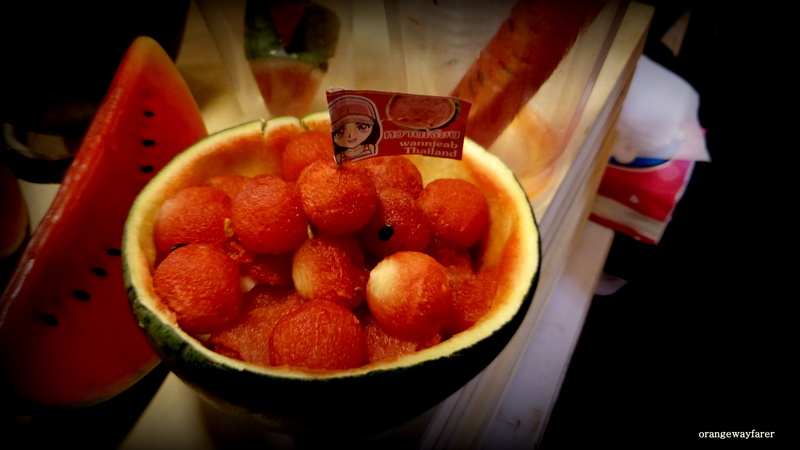 Thais surely know how to decorate melons daintily. It was from the streets of Bangkok as celebration of Chinese new year galored in the city! Quintessential best art of the day! Before you are ready to hike up, up and up, fuel up! 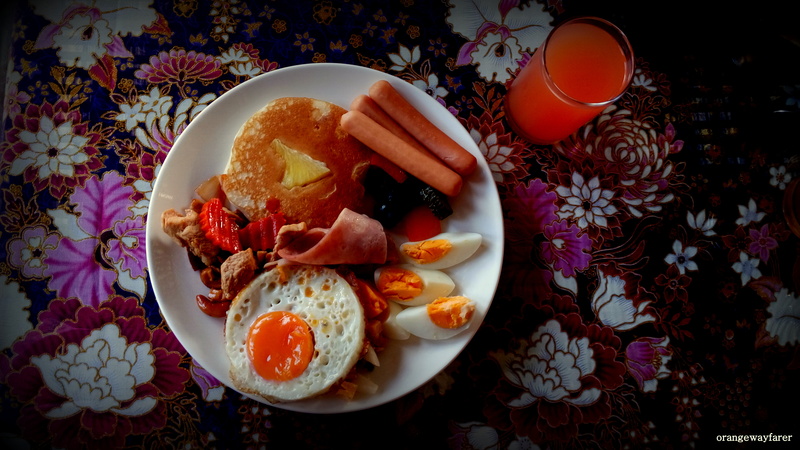 My breakfast plate from the Railay beach! 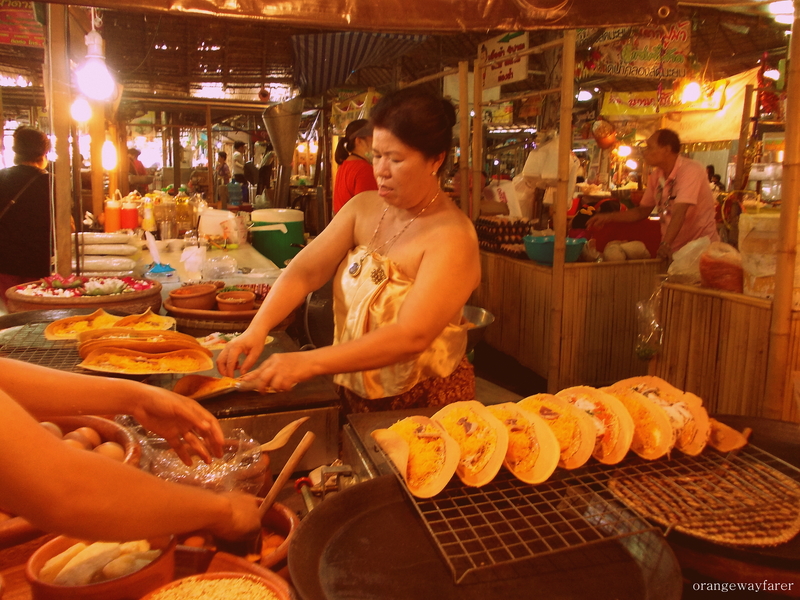 When in Bangkok, spend a lunch at the floating market. 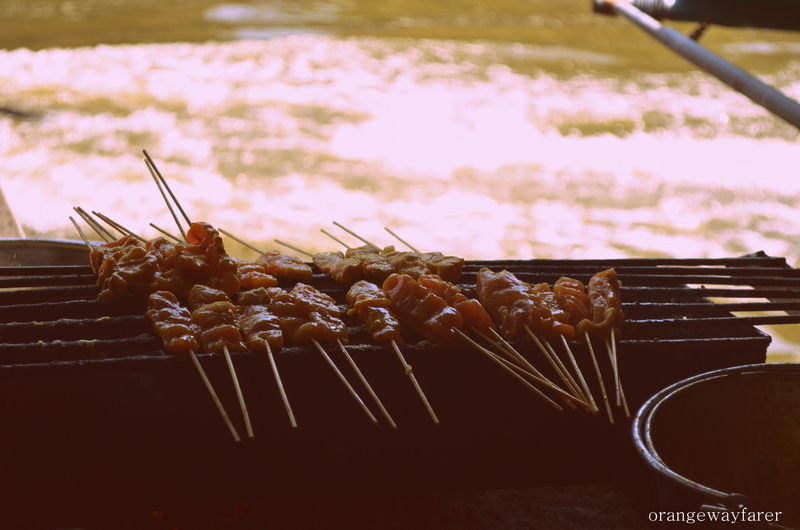 With the makeshift haven on the canal and a rail track over your head, observe the locals grill your food on charcoal by water. 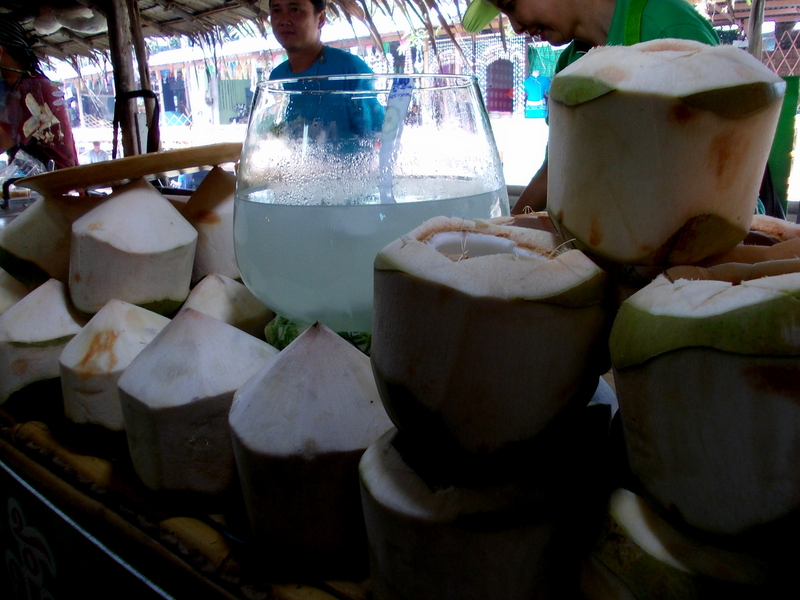 To cool down a thirsty soul, at a floating market. Dried fish on a stick. In my country, in India, we call it Shutki. 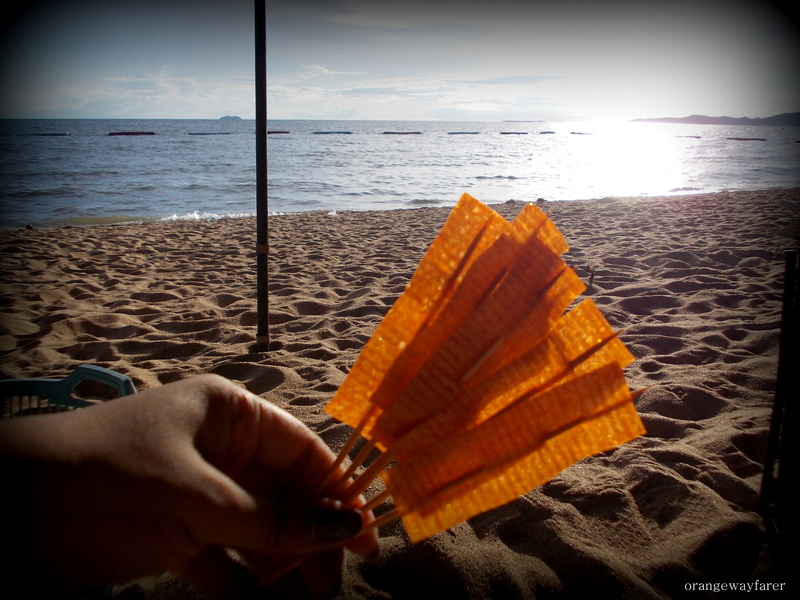 At the Jomtien beach Pattaya! I would say only good memory from the place. 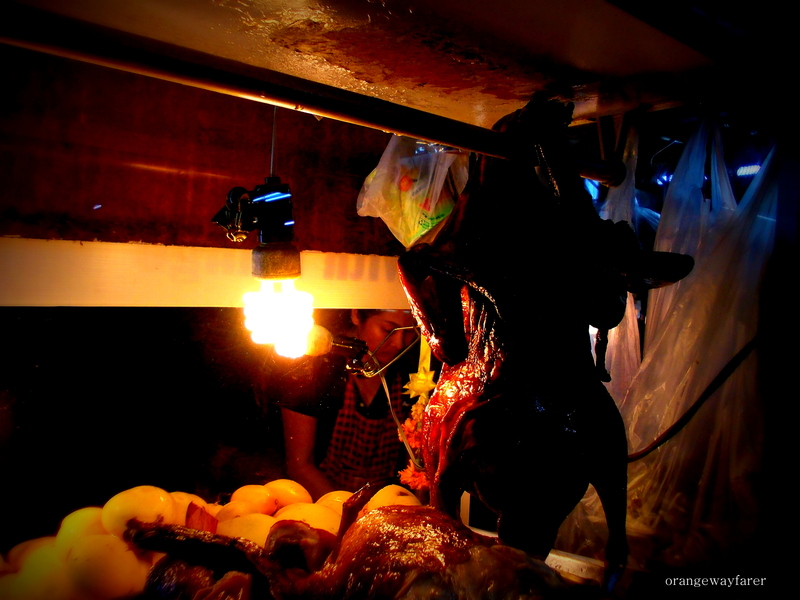 How to strategically hang a grilled duck? 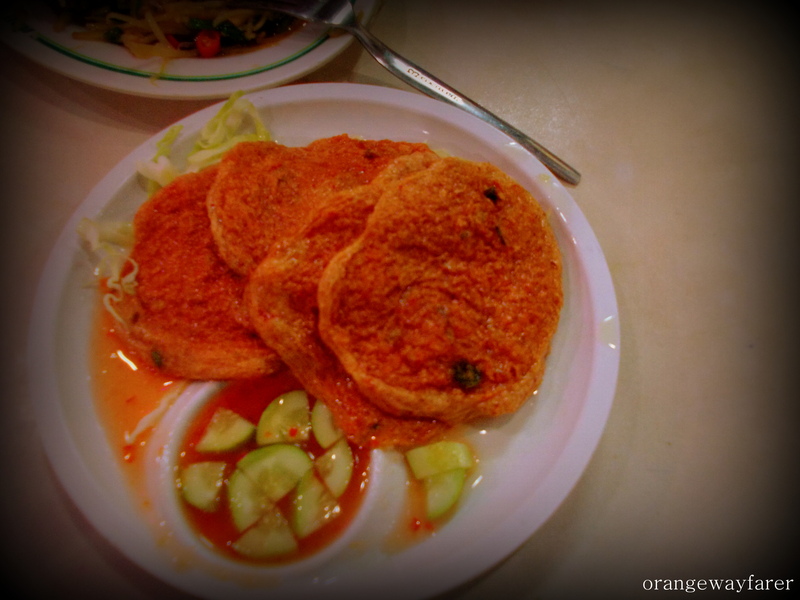 The much coveted Fish cakes from China town of Bangkok! Mussels and how to eat them! 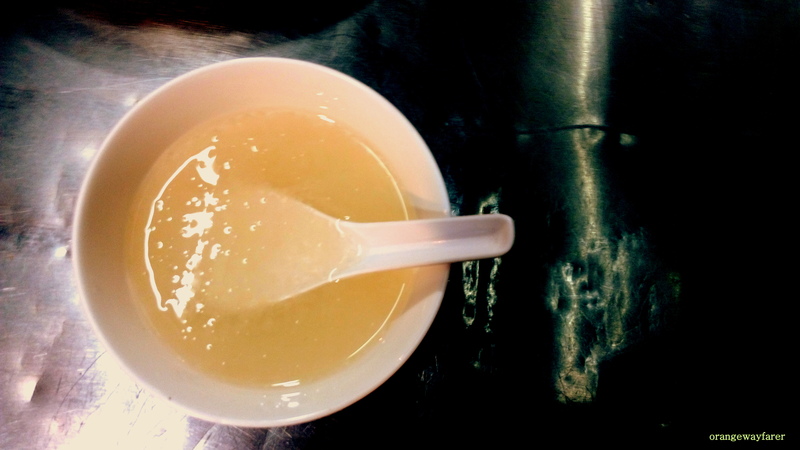 The famed Bird’s nest soup, made from the saliva of a bird. Royal delicacy of the land. It is suggested you consume it with warm milk. The food in Thailand was indeed something that taught me a thing or two about myself, life and universe and all such existentialisms. It was indeed. While not all of those experiences reached an extent of fuckall goodness, lots did, and I was entirely at awe how some of these were what they were at the expense of less than 50 bucks in native money. The author tells me there is a lot of international non-english speaking traffic to her site and for their interest, it is entirely cheap, 4 of those 50 bucks wont buy you a mcd. Kudos to the great work in taking and editing the photos, and keep up the good work. Let there be more green and long live rock’n’roll. Ciao! The food in Thailand was indeed something that taught me a thing or two about myself, life and universe and all such existentialisms. While not all of those experiences reached an extent of colossal goodness, lots did, and I was entirely at awe how some of these were what they were at the expense of less than 50 bucks in native money. The author tells me there is a lot of international non-english speaking traffic to her site and in their interest, it is entirely cheap, 4 of those 50 bucks wont buy you a mcd. Kudos to the great work in taking and editing the photos, and keep up the good work. Let there be more green and long live rock’n’roll. Ciao! Welcome to orangewayfarer and thank you so much! I fell in carnal love with Thai food. 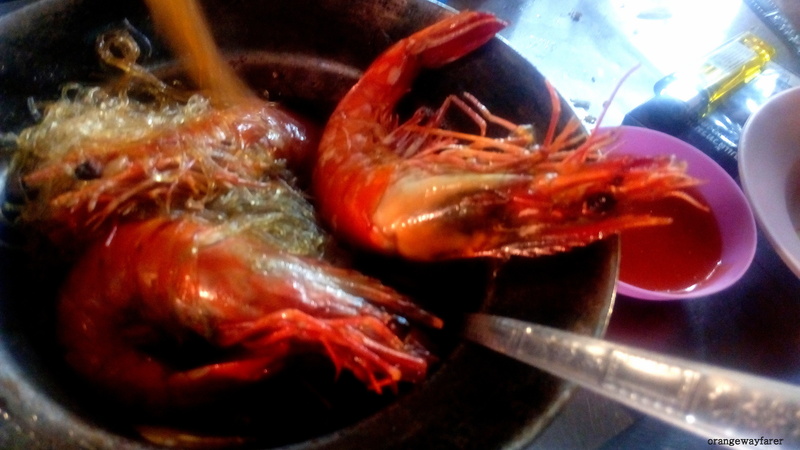 My second visit was all about the excitement of the thought of eating frilled prawns by the river, I swear! True, they are overwhelmingly cheap. Even cheaper than India, TBH. Stay tuned for more stories from the land of Free. Nice post! It makes me excited. because I’ll be going to Chiang Mai in three weeks. Going to eat all the foooood. You are traveling to Thailand? I so very envy you!!! Have a great time there. So google about chiang mai food, I heard the mountain side serve different style of exotics! Thanks. I will see what kind of things I can eat while I’m there. Fresh coconut & Thai food is my fav! 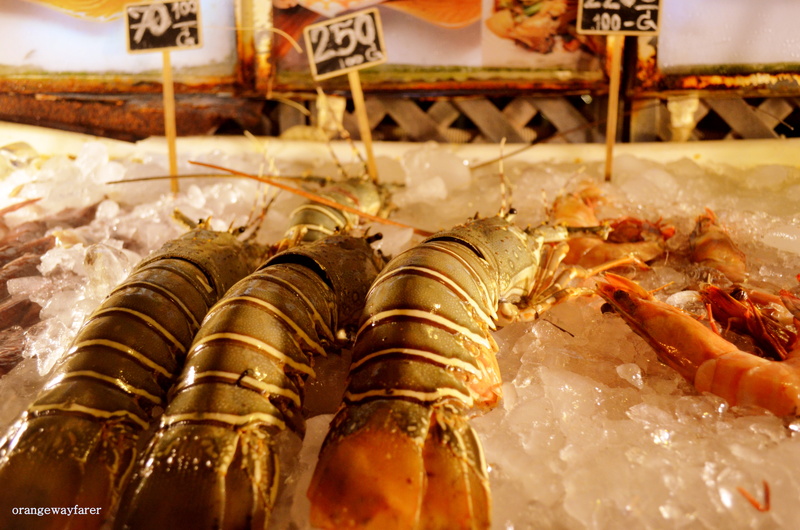 Looks like you had a fantastic food tour of Thailand! Being a vegetarian, I can’t really comment on most of these recipes. Although looks like you enjoyed the culinary a lot. Would you have any particular recommendations for me for my future visit to Thailand or is it too tough to get veg food there? no no you get vegetarian food a plenty. do try their coconut ice cream! Hey! Love your pics and writing style. I’m a vegetarian so can’t comment on these dishes, but I never struggled with finding veggie food over there. Delicious! Congrats! ♥ Don’t forget to leave me a comment with a link to your entry so I can see your answers and nominations. I can’t wait to see what you’ll write! ? Hey thanks a ton! Will surely do this ASAP! My pleasure. 🙂 I also really like your blog layout! It’s so clean and organized, but still very engaging. Keep on bloggin’! We visited Thailand but didn’t taste a single Thai food, I regret it now after seeing you post? Bdw I didn’t know that you are from Bangalore just read your post on iftaari food and all. I too stay in Bangalore ? Oh my god! See, the world is a small place. 🙂 you must have visited the iftar stalls? No dear, I was busy preparing iftar meals at home? during Ramadan we prefer preparing iftar food at home. Occasionally we buy outside stuff, it’s just that we fast the whole day and then we end up having healthy homemade food. This post gives me foodgasms! Orange wayfarer has been my inspiration to start blogging! Do visit her blog when free, there is plenty to explore and I assure you that you will not be disappointed! https://orangewayfarer.wordpress.com/ Happy reading! Such a pleasant feeling to Know I have been able to inspire someone as creative as you! Thank you so much! Thanks for being around, when I need someone the most! Hugs! Everything looks delicious! My brother is visiting Thailand soon and I’m getting even more jealous. Wow! Thai is my favourite, this blog makes me hungry!! great pics ?